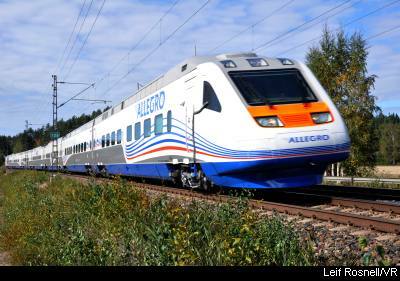 Here is a picture of one of the new trains that have just been instated on the Helsinki (Finland) to St Petersburg (Russia) route. The train is called Allegro and apparently there will be visa required for travelling on the train. Great! With the new train, the travelling time is 3 hours 30 minutes - earlier it was over 6 hours. The price for the trip has doubled according to what I read. It is now 84 Euro for a return ticket. Cheaper than flying though and the article explains there is still a saving compared to before, since the visa alone was 40 EUR. This train looks a bit like the Eurostar (London - Paris train), I think. I once travelled this route and I must say the trains were a bit dated but very comfortable. The border control took a long time then, hopefully they have speeded that up a bit. This is a great development, more like this! How to train listening better?